New research finds tall and older Amazonian forests more resistant to droughts. Credit: CC0 Creative Commons, Pixabay, user:stokpic . Tropical rainforests play a critical role in regulating the global climate system—they represent the Earth's largest terrestrial CO2 sink. Because of its broad geographical expanse and year-long productivity, the Amazon is key to the global carbon and hydrological cycles. Climate change could threaten the fate of rainforests, but there is great uncertainty about the future ability of rainforests to store carbon. While severe droughts have occurred in recent years in the Amazon watershed, causing widespread tree mortality and affecting the forests' ability to store carbon, the drivers of tropical rainforests' sensitivity to drought are poorly understood. A new study led by Pierre Gentine, associate professor of earth and environmental engineering at Columbia Engineering, shows that photosynthesis in tall Amazonian forests—forests above 30m—is three times less sensitive to precipitation variability than in shorter forests of less than 20m. Taller Amazonian forests were also found to be older, have more biomass and deeper rooting systems that enable them to access deeper soil moisture, which makes them more resilient to drought. The paper was published online May 28 on Nature Geoscience. "Our findings suggest that forest height and age are an important regulator of photosynthesis in response to droughts," says Gentine, who is also a member of the Earth Institute and the Data Science Institute. "Although older and taller trees show less sensitivity to precipitation variations (droughts), they are more susceptible to fluctuations in atmospheric heat and aridity, which is going to rise substantially with climate change. Our study shows that the Amazon forest is not uniform in response to climate variability and drought, and illuminates the gradient of responses observable across Amazonian forests to water stress, droughts, land use/land cover changes, and climate change." Climate change is altering the dynamics, structure, and function of the Amazon. While climate factors that control the spatial and temporal variations in forests' photosynthesis have been well studied, the influence of forest height and age (affected by deforestation for instance) on this controlling effect has rarely been considered. Gentine used remote sensing observations of solar-induced fluorescence (a proxy for photosynthesis), precipitation, vapor-pressure deficit, and canopy height, together with estimates of forest age and aboveground biomass. His group applied statistical techniques to estimate how age and height could modify forest sensitivity to droughts. Gentine's remote sensing observations showed that tall and older forests were less sensitive to droughts but more sensitive to heat and atmospheric dryness. This finding has implications for the capacity of younger vs. older forests to withstand—or not—future droughts. For instance, deforestation could increase the fragility of the forests to droughts, as the forest becomes younger and thus more sensitive to droughts. "Our study makes it clear that forest height and age directly impact the carbon cycle in the Amazon," Gentine says. "This is especially significant given the importance of the Amazon rainforest for the global carbon cycle and climate." 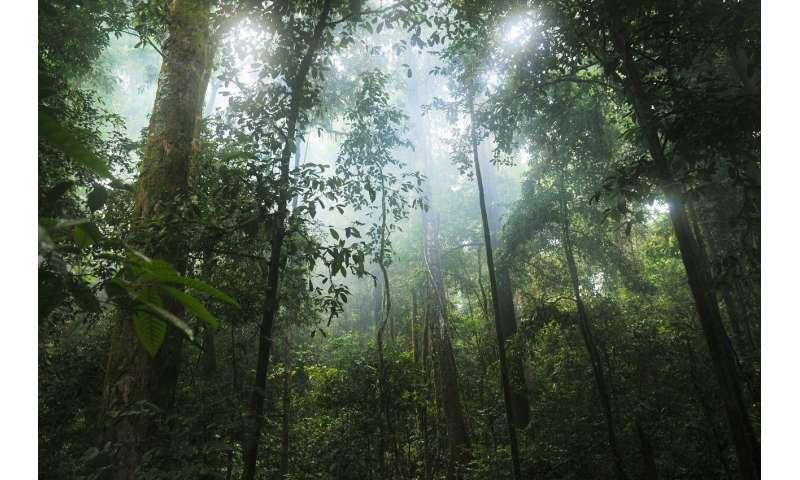 The study is titled "Tall Amazonian forests are less sensitive to precipitation variability."